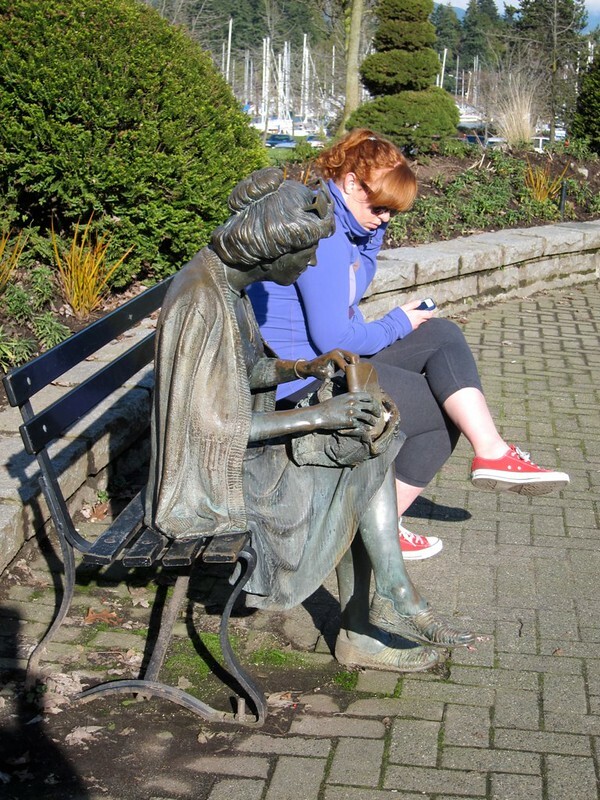 This week’s photo challenge is headed by a picture of a sculpture of a woman sitting on a bench in a park. I’d Rather Be… is the beginning of the challenge – insert word or words of the activity you enjoy most. Ummm, no, I am not going to do that. It reminded me of this picture, which I took in 2013, while walking with my partner. Today my partner is elsewhere, doing something very useful. But I would rather that we were together. Maybe even going for a walk somewhere like Stanley Park if the weather was nicer. Though I can’t claim that walking is my favourite activity. Under the photo on flickr I wrote “I swear that this photo was not posed in any way. The young woman sitting next to the statue is unknown to me, and her mirroring of its pose was, I am sure, unintentional. A genuinely candid shot. ” And I also provided a link which did not actually work, so I had to update it. The sculpture is by J Seward Johnson and is called “Search”. Candid shots are the very best. I’ve never been one to like posed portraits, or going to a studio. It’s so much more life in a photo like yours. It definitely triggers a thought process. I’d Rather Be … Walking on the Beach – What's (in) the picture? You handled the week’s challenge well, with the similar photo to the challenge.